Wharton Park is on the outskirts of Bewdley and a short drive from Kidderminster. It is part of The Club Company along with 11 other courses. It has some of the most scenic holes you are likely to come across. 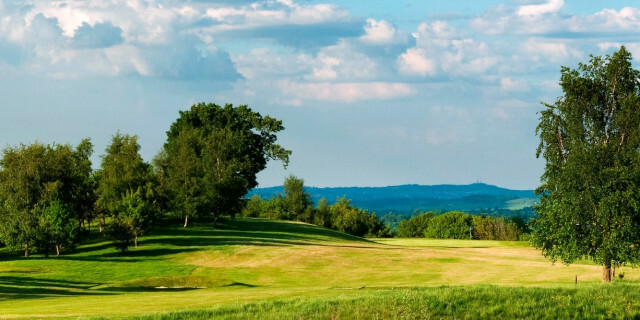 A great mix of holes make this a course that is playable for all levels of golfer. It is a parkland layout that was designed by Howard Swan in 1992. There is a 12 bay floodlight driving range, putting/chipping greens, large pro shop and a fleet of buggies. 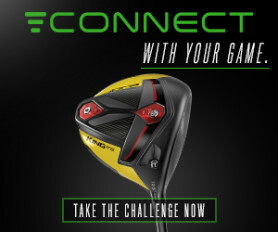 Also you have The Ashley Picken Golf Academy with custom fitting available. Upon arrival a friendly welcome awaited me from Ashley Picken, the Head Teaching Professional. We had a quick chat and look round the large sized pro shop which had plenty of gear, clothing etc We then headed out past the large putting green onto the course. The front nine starts with a reachable par 5 for the long hitters that is all uphill and doglegs from right to left, anything more than a par here really feels like a poor start to your round. The 2nd is a reachable par 4 that is a proper risk reward off the tee, for me a fairway wood and pitch into the green was how I chose to play it. The first par 3 is the 3rd and its a great looking hole set against the wood behind. The 4th, 5th and 6th are par 4s that really are all about putting your tee shot in play to give you a sight of the greens and leave mid-short irons into. 8th at 132 yds plays longer as its all uphill and you can only see the top of the flag so make sure you club up and don't come up short. The final hole of the front nine is like a lot of holes here and again is about putting your tee shot in the correct place to allow a shot at the green in two or laying up to a good yardage and getting a good luck at the green ahead. The back nine starts with a tricky par 3 where anything other than on the green can easily lead to a double bogey. 11 is a short par 4 that again requires a well placed tee shot enabling a good look at a green protected left and right by bunkers. 12 is a par 5 dog-legging to the left that is only reachable for the longer hitters as the second shot is all uphill to a green with bunkers left and right. 13 and 14 run parallel to each other and really need a good drive if you are to par these holes. 15 is a great par 3 with the tee set well above a green which again is set against the wood behind, any miss-hit shots will be gobbled up by a ditch short of the green. 16 (Amen Corner) is a par 4 with a 90 degree dogleg to the left that requires just two mid irons, the first to the fairway and the second over the pond to a green with a large bunker in front. 17 is a driveable par 4 or a wood/hybrid leaving a pitch into the green and this is really a hole that can be birdied. 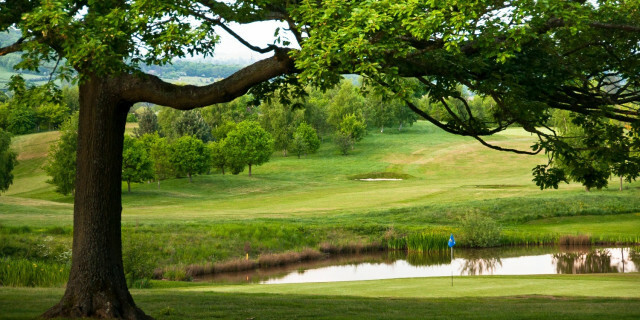 18 is the real signature hole with the tee looking down the fairway with the green in the distance protected by a ditch and pond with a great backdrop of the clubhouse behind. For me the 15th and 18th are the holes that really stand out purely due to being able to see everything ahead from the raised tees. 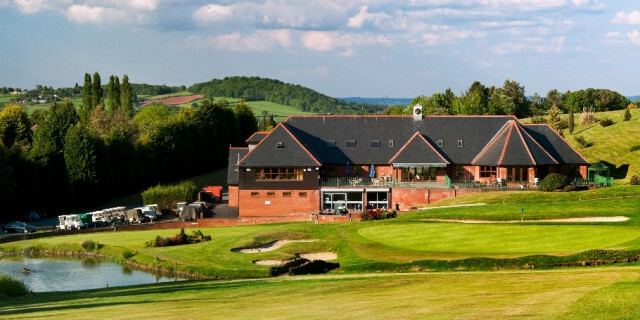 18 especially is a fantastic finishing hole all downhill with water by the green and the clubhouse and balcony behind. Both loops require accurate well placed tee shots. The bunkers are all well placed whether on the fairways or greenside. The greens were all superb, receptive for approach shots, looked great, rolled true and were fast too. Given the recent hot/dry conditions I thought the course was in a truly great condition. Suitable for all levels of golfer. The shop is well stocked. Staff all very friendly and welcoming. Plenty of variety of food and drink was also on offer. Function room, restaurant, cafe and even rooms to stay in make this a great venue. At just under 6500 yards off the whites this is a long course that would play even longer in the winter, and there are some decent walks between holes also make the course seem longer.